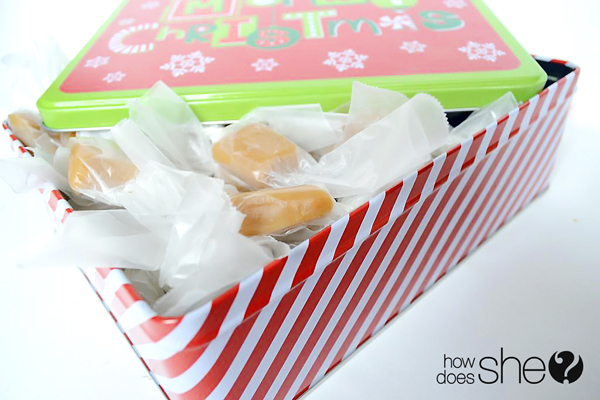 15 Minute Holiday Caramels: Perfect Quick Gift! We all love easy, tasty, and QUICK gift ideas, right? Well, my Christmas is never complete without holiday caramels. Lucky for me, I have a fantastic friend/neighbor who whips these up for me every year. When I asked her for the recipe, I couldn’t BELIEVE how easy they were to make, so I begged her to share the recipe with you gals. 🙂 Trust us, it will make neighbor gifts a cinch this year. Take it from here, Jess! One of my favorite things about the holidays is all the yummy treats. As much as I love to indulge my sweet tooth with all this goodness, I’d rather spend my time out on adventures. Enter my 15 minute caramels. They’re smooth, buttery, and sweet and most important a piece of cake to whip up in a flash. Melt the butter in a large glass bowl. Add all ingredients except milk and stir well. Microwave on high for 13 minutes. To be safe, put a plate under your bowl in case it starts to boil over. Remove from microwave and stir again. Pour hot caramel into a buttered 9×13 pan and allow to cool. Cut into 1″x1″ squares and wrap in wax paper. Now you have some delicious treats with plenty of time left in the day. These make perfect gifts. You’ll be the talk of the neighborhood, and it will only take you 15 minutes! That’s my kind of recipe. These caramels make perfect treats to take skiing, snowshoeing, sledding, or wherever winter takes you. Throw them in your backpack and let your adventures begin! -Melt the butter in a large glass bowl. -Add all ingredients except milk and stir well. -Microwave on high for 13 minutes. To be safe, put a plate under your bowl in case it starts to boil over. -Remove from microwave and stir again. -Pour hot caramel into a buttered 9×13 pan and allow to cool. -Cut into 1″x1″ squares and wrap in wax paper. Now that you’ve made your awesome caramels, here are some great free printables we designed just for you! Jessica blogs over at Bring The Kids, where their motto is “proving your outdoor adventures don’t end when you have kids”. She works hard to maintain her passion for the outdoors by bringing her 3 little kids along on her adventures. Alysha is a twentysomething ice cream enthusiast who lives in Colorado with the love of her life and two children. She loves garage sales, dancing in the kitchen, and slowly making her house a home. Her Halloween and Christmas decorating posts were both featured on Better Homes and Gardens last year. She also has an absolute love for photography and documenting life's little joys. mmm. caramels. This is too easy NOT to try! Thanks for sharing! Just made these can’t wait for them to cool! Thanks for the awesome, easy and quick recipe! Love this! I think I might need to try it tonight. Yum! And a recipe easy enough for me to attempt. I can not WAIT to make these today! I’ve been looking for a recipe like this! Thank you! Easy!!! My type of recipe. ON my to do list this season 🙂 Thanks Jess. Awesome! I’ve never tried caramels (even though they are my favorite to eat) but these sure look easy! I’m about to go bust some of these out. I’ve been wanting to make some caramels, but felt like it was going to be too hard. Thanks for sharing the microwave way! Love to try these but wot is corn syrup? It’s usually sold near the maple syrup, and the big brand is KARO. Awesome recipe….just checking before I make it though. It has 1 cup of butter instead of 1 cube, right? Yep, it’s one cup, 2 cubes. Lots of butter, lots of sugar. That’s why they’re so yummy! They look fantastic! but I don’t have a microwave …is there any other way to make them? Thank you! I’ve heard that you can do it on the stove top and just cook it until it reaches a soft ball stage. I’ve never tried it, but it should work. This is the best holiday gift! I love it. Made these last night and you weren’t kidding! These were SO EASY to make and we love, love, love them! I love that you don’t have to mess with a candy thermometer. Fantastic! How long should it take them to harden and cool ? I’m getting worried that they won’t turn out right? I did something wrong…they never hardened. Maybe it was just too humid today or something. Is it light or dark corn syrup? Thank you so much for this recipe!! It’s just what I’ve been looking for. I can’t wait to try it. My 1st batch didn’t turn out smooth and pretty looking–think my micro was too hot, but the 2nd batch looks really pretty. Tastes 1st batch and still tastes wonderful–hubby said those are his and the other one can be for the gift tins. I was wondering what did you do different to make the second batch smoother? My first batch is cooling right now and is not smooth at all. I had to come back here and check the picture, mine looks like the picture of it in the bowl all bubbly. Make sure you stir it really well after you cook it. That should help a lot! Years ago I took a candy making class. And for the caramel filling we put a can of Bordens Condensed unopened, put in a pot and covered it with water. Brought it to a boil and let it then simmer for a couple of hours. Being sure the can was always covered with water. After a couple hours take out let cool, open tin and you had the best Mac Toffee. Sad they took the bars off the market. But this is way cheaper. Enjoy. Hi. I made the Carmels and they came out very soft, almost like thick batter ..is that right?? Or what did I do wrong?? They taste yummy though. Maybe you needed to cook longer? Not sure! My finished caramel looks just like yours in the pan. It cut beautifully but…. comes out of the pan like soft taffy. It’s cooled, what’s up? Just made these and they turned out great!! Perfect for gift giving!!! thanks for easy recipe! Will post pics soon on my blog! So easy and yummy!!! Great for my wine and desert baskets I made for gifts. Thank you! I made these today, sprinkled a little chopped pecans on top ~ very yummy and easy ! Alysha, I was just wondering….what is the wattage of your microwave? Maybe some are having a problem with this because of the varying strengths of microwaves out there and the cooking time would have to be adjusted according to each one’s microwave. A higher wattage requires less cooking time, a lower wattage requires longer cooking time to get the desired result in texture or the caramels will not firm up after cooling. Please try to remember to include the wattage of your microwave in your microwave recipes in the future so that we can make the proper adjustment and not waste ingredients/failed batches/money when making the recipe. Thanks for sharing! My microwave is 950 watts. Hope that helps! I had to make these. They turned out great, and they were so easy! Thanks for the recipe! This lovely and really easy, but corn syrup is not easy to find in Portugal. Any sugestions? How long do these last? Can I make them in mid-November for Christmas gifts? If I wanted to make them on the stove top how long would I cook it for? Caramels are my favorites!!! I am so making these in the morning! I have all the ingredients. Fast to make and I’m sure they are yummy! Thanks for sharing!! Can you use margarine, or do you have to use real butter? I made these today for Christmas treats. I have a full sized microwave, and they came out perfect using the directions provided. I did use a 14oz can of condensed milk as that is what the one in the picture was. They are incredible and so easy! Ooey gooey yumminess! They turn out like the kind you can buy at the checkout counter in specialty stores; soft, chewy and absolutely delicious….not firm or hard in any way. They do take a while to cool enough to be manageable for cutting and wrapping, so be patient, stick them in the fridge for a while or do it the next day….they are well worth the wait! I found that when cutting them, because they do remain soft, it’s easier to use a small spatula and just press down into them rather than pulling a knife through them because they just sort of smear. The good thing is that when you wrap them, you can shape them as well, so don’t worry if they come out of the pan in mis-shapen chunks. It’s all good in the end! :). Thank you so much for this wonderful recipe! I wanted to post my experience just in case it helps anyone else. I made these tonight, and when I took them out the mixture was kind of gritty where it had separated while cooking. I stirred and stirred with little luck, because I remembered Jessica’s comment about stirring well. It still looked pretty ugly, so I threw it. N the bowl of my kitchen aid mixer because I figured I didn’t have much to lose at that point. I used the which attachment and worked it up to top speed for a minute or two. That worked like a charm! It all mixed smoothly together, and I had a pretty layer when I poured the mixture into the pan. Just be careful not to spill or touch the caramel because it’s super hot. I accidentally stuck my finger in a bit on the edge of the bowl (and I had to handle the steel bowl with a towel to pour) and it burned a bit–nothing a little lavender oil couldn’t fix, though. I was looking on your website for a caramel cake recipe (didn’t find one), but I ran across this recipe. I made them, and they were fabulous. So easy, and wonderfully creamy and good. I will definitely make them again. what wattage is your microwave? Want to try this, but my microwave is 1250 watts. Any suggestions?? Use this site to find out the exact time to cook for our microwave wattage. The recipe uses a 950 Watt for 13 minutes. And, I have made these, wrapped and frozen without issues. Alysha,, do you use salted butter or unsalted? I was so bummed when I made this because I had been craving caramels and only had enough ingredients for one try, mine seemed like it curdled or separated really bad, I read through the comments and to the person who said use a mixer thank you! Use the mixer really slow at first then slowly go up speed, it still has a little texture but way better and can’t wait for it to cool!! If you were to add flavouring at what point would you add it. And would there be a specific type of flavouring? I’ve been making caramels at Christmas for over 30 years. This recipe uses the same ingredients and the photos look very similar to the preparations I’ve always used.. I look forward to trying this time saving recipe this year. Mine were all lumpy. I followed the directions exactly.